The Department of Arts, Culture and Media invites you to the third Music Matters event of the 2018/2019 Lecture Series. 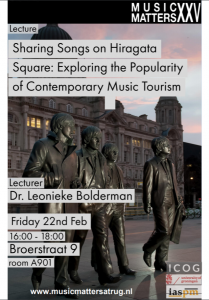 This talk will be on the topic of music tourism and will take place on February 23rd. Music plays a key role in creating and shaping tourism destinations and experiences. Music tourism is seen as a way to stimulate economic growth, to contribute to urban revitalisation and to attract new audiences – The Beatles’ Liverpool is one of the most successful and well-known examples of this development. Despite high economic and social expectations, little is known about the ways music stimulates tourism, and why people travel to locations associated with music: what explains the popularity of contemporary music tourism? Drawing on a four-year research project, including 52 interviews with tourist and ethnographic fieldwork conducted at Wagner’s Bayreuth, ABBA’s Stockholm, U2’s Dublin and various music workshops, in this Music Matters lecture Leonieke Bolderman approaches music tourism from the perspective of the tourist, discussing the ways tourists imagine and experience music-related destinations. 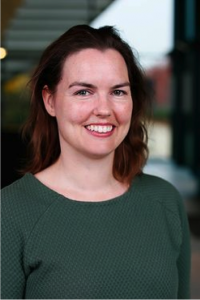 Leonieke Bolderman is Assistant Professor Cultural Geography and Tourism Geography and Planning in the Faculty of Spatial Sciences at the University of Groningen, The Netherlands. She graduated from the research master Literary and Cultural Studies at the Faculty of Arts of the University of Groningen in 2009, and from 2010 until 2013 she worked as a press officer to the Rotterdam Philharmonic Orchestra. She returned to academia in 2013 to pursue a PhD in social sciences at Erasmus University Rotterdam. Her research on music tourism was part of the project Locating Imagination. An Interdisciplinary Perspective on Literary, Film and Music Tourism, funded by the Dutch Organization of Scientific Research. As part of her project, she spent spring of 2016 as a visiting researcher at the Institute of Popular Music in Liverpool, UK. In March 2018 she completed her PhD with the dissertation Musical Topophilia. A Critical Analysis of Contemporary Music Tourism. Currently she divides her time between Groningen (NL) and Detroit (USA), exploring the role of music heritage and tourism in urban development.